... from the perspective of a younger sister. The day, September 6th, 2008, was simply perfect. Though a bit hot outside, the sun was shining and the sky was true blue with fluffy white clouds. After sleeping in somewhat late because of a headache, I headed out to the kitchen to eat breakfast. Things were already in full swing, family eating breakfast, and a bridesmaid arranging bouquets for the wedding fountain. Pretty soon, the bride herself, my sister, came inside with cereal in a heart-shaped tin, the prize at the end of the treasure hunt her husband-to-be had set up for her. She looked so serene and happy; a beautiful bride for a beautiful day. It was fun to see the love in their eyes! Everything was all 'a flurry as we prepared to head to the church. 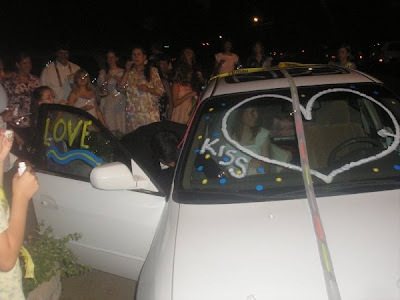 Finally, the girls (sisters, bridesmaids, and cousin) piled into 3 cars to drive over. I rode with Miriam and Jubilee. As we pulled out, I asked Miriam, "Can you believe you're getting married today?" "Not really..." she responded, as she pulled out of our driveway for the last time as a Lofgren. About to change into their wedding garb. Today they'll be married!! Soon after we got to church, the wedding party began getting prettied up. A friend from church did everyone's makeup, and one of the bridesmaids helped with hair. I mostly took care of the baby of one of the bridesmaids, and did whatever else needed to be done, helping Miriam with last-minute things, picking up my sister and her children from the hotel, and so on. The church and reception hall each looked wonderful, decorated by two ladies from the church and my mom. Miriam received so much great help from friends! Pictures were taken before the ceremony and I had fun watching different poses get set up. 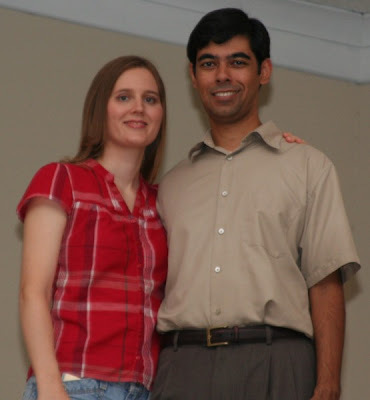 Two friends from church took pictures and another friend helped set them up. In between them all I helped find people, took care of children, and, oh yes, got prettied up myself! 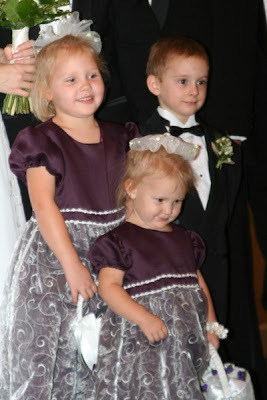 Such cute little members of the wedding party! It was fun trying to fit everyone on the stage for family pictures. With a new niece born and a new brother-in-law, our immediate family now has 20 members. What a blessing! The bride and groom with their families combined. It's been a joy to get to know John's family as friends! Around 2:15 p.m. people began arriving, so picture-taking began to be wrapped up. As 3 p.m. and the start of the ceremony drew closer, I alternated between greeting friends, helping with last-minute things, and holding onto the ring bearer's pillow. Since the real rings were tied into it, I definitely didn't want it to get lost! Soon most guests were seated in the sanctuary, and I stood in the foyer keeping track of my cute ring bearer-nephew Zach and cute flower girl-nieces Sara Rose and Lisa Beth. There were last minute instructions to give ("Make sure you hold your pillow flat!" "Don't forget to smile and sprinkle your flower petals!") and a tired, almost-2-year-old flower girl to comfort. Miriam appeared in the hallway on Dad's arm, looking radiant and peaceful. I stood with the wedding party in the foyer, listening to the beautiful pre-wedding music played by two of John's friends. 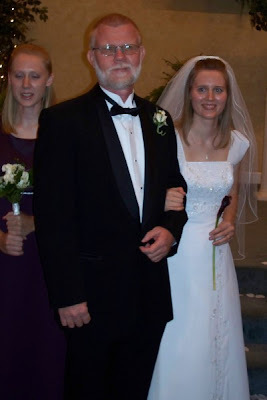 All of the music was planned by the groom, John, and many of the hymns were arranged by him for piano (played by my brother-in-law Ron) and violin (played by "The W Brothers," a string trio of which Jubilee's violin teacher is a part). The official wedding music then began, and the bridesmaids walked down the aisle one by one. 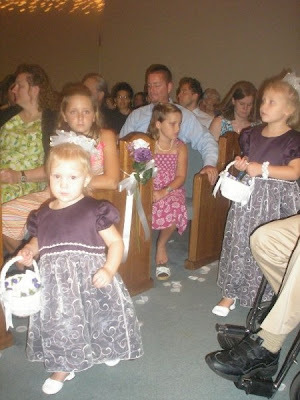 I sent the ring bearer down, then the flower girls. "Go to Mommy, Lisa Beth!" I whispered, and she did, falling fast asleep in her mother's arms soon after she walked down the aisle. 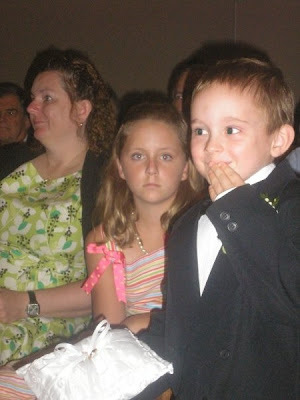 Zach (age 5) and Sara (age 4) stood with the other wedding party, behaving so well! 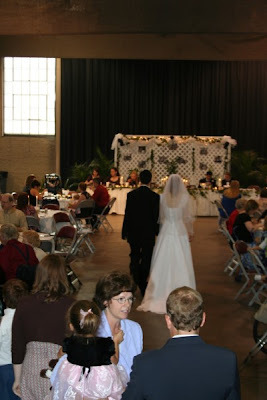 The bride's processional music began to play, and I spread out her train one last time as she entered on my Dad's arm. I helped the wedding coordinator (another friend from church!) close the doors, then slipped in to my seat as Miriam took her place in the front. Miriam just carried one flower down the front, then many of her close friends filed forward, each with a white rose, to make up her bouquet, symbolizing the unity of the body of Christ. Zach carried the rings so well! 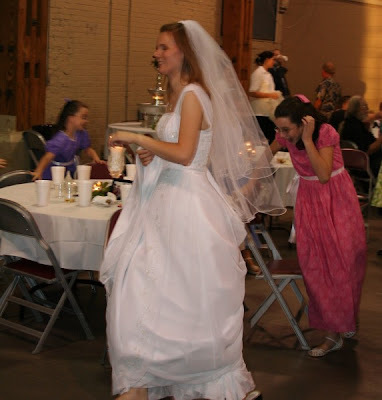 Whereas at the rehearsal, we always had to get Lisa Beth to follow Sara down the aisle, at the actual ceremony, she led the way! The whole ceremony would take too long to describe, but it went by beautifully and smoothly. There were so many elements involved that were meaningful and lovely. The music, the sermons given by John's pastor and Miriam's pastor, the unity candle, the hymns sung by the congregation, and the scripture readings of which I was a part all fit together so well. Soon, it was time for the vows and rings to be exchanged. The pastor pronounced them husband and wife and explained how they, at age 28 and 29 had kept themselves pure for each other. They have indeed been an example to me and to many, as they hadn't even kissed before their wedding day. Finally, the pastor said, "John, you may now kiss the bride!" To my shock I saw my nephew Alex run onstage at that moment. "What in the world?" I thought, as I saw him hand something to John. Then we all burst out laughing as John presented Miriam with a huge Hershey's kiss! Well, yes, she does like chocolate! =) I later learned it was all a part of their plan, and it certainly lightened the mood. Then they did kiss for real, for the very first time. Yes, it's a kiss all right! The recessional was lovely, then we all gathered to one side of the sanctuary as the wedding party came back onstage for a huge group photo to document all of the guests who had come for the special day. 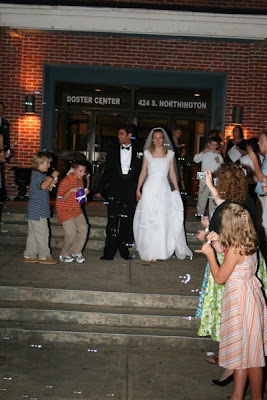 Everything was 'a buzz as we all headed over to the Doster Center for the wedding reception/dinner. We enjoyed the delicious food, cake, bubbles, and musical chairs! The cakes were made by another friend of Miriam's from church, who had a business making and decorating cakes. They were so lovely and tasted delicious! 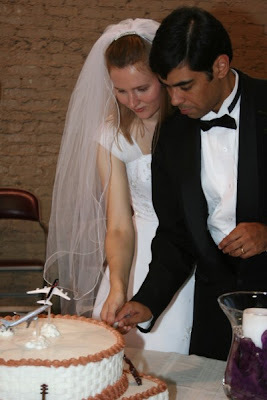 The groom's cake was decorated with airplanes and violins, since John is fascinated by airplanes and plays the violin really well! 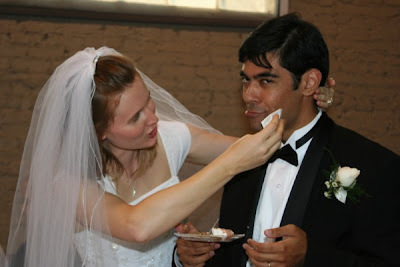 They were nice feeding each other the wedding cake, but with the egging on of the crowd, they smeared a little of the groom's cake on each other. Miriam very kindly wiped it off John soon after, though! 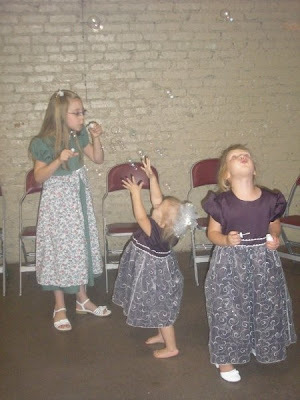 All of the children really enjoyed the bubbles! Yes, we played musical chairs at the wedding reception! It was a compromise between John, who wanted to have dancing, and Miriam who didn't. Even the bride and groom got involved in the game, as did the rest of the attendees, going around and around the tables. The boys were very enthusiastically waiting to catch the garter, because John put it around a foam football to throw it. Maybe it wasn't such a good idea, though... 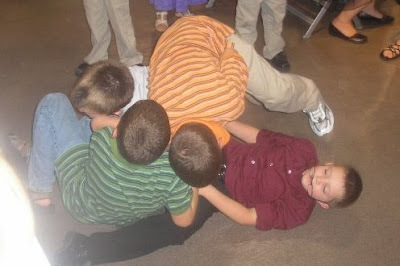 The younger boys got into a big tussle trying to get it! ... as husband and wife for life. Sorry for taking so long to post pictures from the wedding! It's been a busy month! 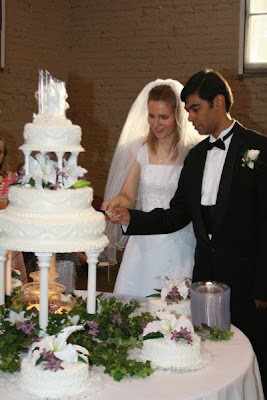 If you want to see more wedding pictures, Miriam is posting a lot, as well as pictures from their beautiful honeymoon! That garter-football picture is great. It captures a lot of the action and even has John looking over his shoulder. What a beautiful wedding! My husband and I attended a wedding for my husbands co-worker friend on September 27th. 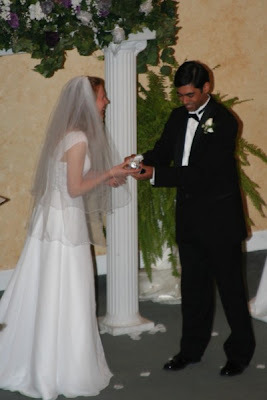 It brought back some memories of our wedding back in 2006 (smiles). That was a great post - nice summary of the wedding day! Eventually I'll be posting more pictures from that day too. It was fun to read your thoughts and what you were doing much of the time. I kinda was caught up in my details so it's nice to hear about the day from another perspective. I'm glad I looked "serene and happy" and "radiant and peaceful!" You know, you plan a bit beforehand, but on the wedding day everything just fell into place and I didn't have to worry about anything. I had so many awesome friends and family members who took care of everything! Thanks again for making all the dresses and adding the sleeves to my dress too! I was just coming on to your blog when I noticed you posted about a wedding for John and Miriam. I didn't think anything of it at first, but then I looked to see if it were the John and Miriam that I knew, and sure enough, it is! I go to Church with them here in Ohio! The wedding looked so beautiful! I think that it is so neat how they saved their first kiss until their wedding day! What a beautiful day. I absolutely adore her dress. Was it homemade or bought (I'm looking for something fairly similiar). The colour scheme is beautiful. Many, many blessings from across the ocean. Glad you all enjoyed the post! It was a beautiful wedding! Amanda: Miriam found her dress onsale (for only around $200!) at a small bridal shop after looking at quite a few different places. It was strapless and a little too big, so I took in the sides and added the sleeves. It turned out well! Great writeup Anna! Thanks for taking the time to document this and share it! Anna, thank you so much for posting pictures and telling about the wedding!! It looks like it was a beautiful occasion!! And I love Miriam's dress! What a fabulous and fun wedding! day in my life. The whole event seemed like a dream. It went by so fast. I am thinking of you as you start off your college career this semester. I hope things are going well for you and that some neat opportunities (whatever they may be) might open up for you as a result of your studies and training. Thanks for posting the wedding pictures! I really enjoy visiting your blog. I was just curious; who all are your brothers and sisters? I've figured out most of them from pictures, comments, etc. But how many siblings do you have that are married? Thanks! Great pictures! I actually wore the same pattern at my best friends wedding as her Maid of Honor. Her mother made the dresses. Her dresses were also purple. Just a question: why wouldn't your sister want to have dancing at the wedding? Jalisa: With all my siblings, I know that it can be confusing for those who don't know us personally! 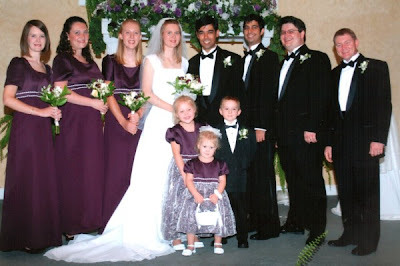 I have 3 siblings that are married - Luke, Maria, and now Miriam, 2 siblings also in college - Lydia and Elijah, and 1 younger sister - Jubilee, who is 13. I am blessed! What a beautiful post! Congratulations to the happy couple. I agree, what a beautiful wedding! We have that same ahead :). Our situation is a bit complicated. We are already married. We took a brief and quiet civil marriage ceremony after my traffic accident (I had a temporary brain damage) so he could take care of my legal affairs with hospital etc. and we could move together because I needed help in daily living back then. I enjoyed of reading this post. Beautiful photos! What a very beautiful wedding!! !